If you have any questions or want to enquire about dates, use our form to contact Maria Concetta Furnari or see their website for more information. Spend a few days at this tranquil agriturismo and you may never want to leave. The hillside farm, built in the late 18th century as a refuge for monks, has been lovingly restored by its English owner Jimmy and original features have survived. No clutter, no fuss, just tiled floors, white walls, dark furniture. The bar and sitting areas have masses of space, bedrooms are simple and some are small, but all are immaculately clean and have central heating and double glazed windows for chillier evenings. If you want a view – of olive groves, vineyards and perched villages – ask for rooms 1 or 2. Do visit the ‘cantina’ and stock up with Durano bounty: olives, preserved apricots and beetroot, wines from Le Marche and homemade passata – an Italian summer in a bottle. There’s plenty to do further afield after your omelette breakfast: the area has lots of tiny medieval villages with interesting churches and works of art, you’re 40 minutes from the cooling sea and a picnic lunch, or lake swimming in the National Park. In spring and summer, walk from the house through wild flowers up to the village of Smerillo. Minimum stay: 2 nights; 3 in July/August. Our stay was just perfect. James is a wonderful host with great suggestions of where to visit. Our room was lovely with glorious views over the hills. The most marvellous breakfasts and delicious dinners. We were thoroughly spoilt! This is a beautiful area and we had a really relaxing stay - would certainly recommend a visit. Great place to stay for many reasons..... cosy and attractive rooms, fun and caring hosts, excellent food, fabulous position for seeing Le Marche and last but not least wonderful homemade raspberry jam. This was an excellent place to visit. James and Concetta were excellent hosts, friendly and very helpful. The accommodation was quiet, simple and comfortable. Meals in the evening were great fun, organised like a house party with shared pre and after dinner drinks and separate tables while eating. The food was stunning, among the best we had in Italy and very reasonable. A true gem. We will return. We spent a very relaxing two days at this wonderful place. The owners carefully plan a day that suits the individual's interest perfectly. The atmosphere is relaxed whilst maintaining a careful eye to detail. Evening meals were superb, better than any restaurant we went to in our holiday. We would definitely recommend this place for stunning scenery and hospitality. We really enjoyed our stay with Concetta and James. The room was very comfortable and Concetta's cooking is fabulous! One can explore the mountains or laze around on the sunny terrace. We did both. A perfect start for 5 nights to our Italian holiday. Nothing is too much trouble and the owners are perfect genial hosts. We will definitely go back, next time with our friends! We had high expectations - and we weren't disappointed. Glorious setting, glorious food, really superb hospitality. Concetta's wonderful five course dinners conjured from local and seasonal ingredients are delivered to the table with panache by Jimmy, who also serves excellent wine.. Both enjoy a late night grappa with their guests: they make an incredibly well run business look easy. 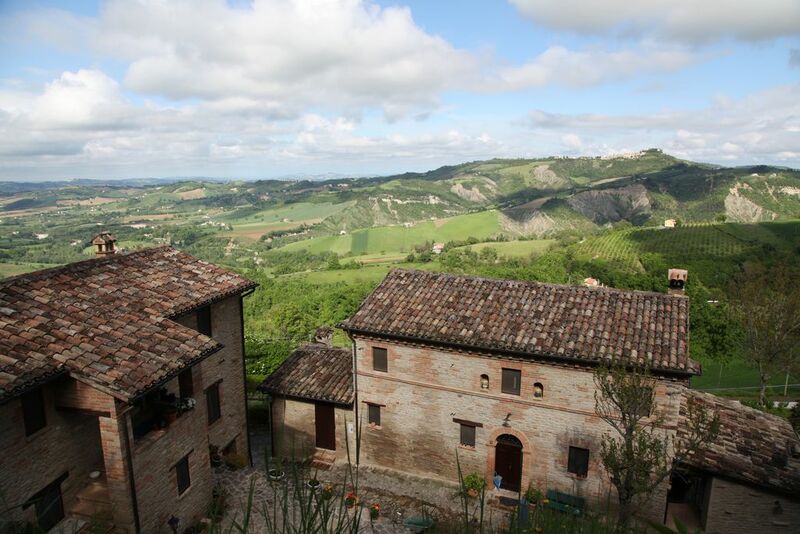 A "must stay" in Le Marche. I wish we stayed here more than one night. We had an excellent dinner and breakfast while we were there however. The food is really really good! Concetta and Jimmy were very generous and hospitable hosts. The rooms were spotless, everything worked and the grounds were well kept. Next time we will for sure stay longer. a stay would not be complete without a visit to the nearby national park of the Monti Sibillini especially the "hell's throat gorge" fantastic flora and fauna in this suprising gulley featured in many guide books-"le gole d'infernaccio"
in the neighbouring village of Monte San Martino right at the top of the town the church houses a priceless work of art of Crivelli XV century artist of great importance. during your stay at Contrada Durano you may be suprised to discover that we actually have "shopping"real factory outlets of leading designer companies like PRADA, TODD'S, NERO GIARDINI are little more than half an hour away by car.